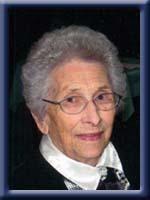 TOPLIS – Irene Christopher, 92, of Milton, Queens County, passed away peacefully in Queens General Hospital, Liverpool on Monday, March 19th, 2012. Born in Grand Prairie, AB, she was a daughter of the late Frank and Winnifred (Christopher) Freeman. Irene graduated from Normal College in 1939 and taught school for over 40 years until her retirement in 1980. She was a life member of Milton Baptist Church and a founding member of the Queens Quilters. She was a member of the Gorham Chapter of the I.O.D.E. and past member of Arbutus Chapter # 30 Order of the Eastern Star. She is survived by her son John (Elsa) of Milton and grandchildren, Kevin and Joanne (Terry), as well as step-grandchildren Shawn (Heather) and Krista (David); step-great-granddaughter Gracie Baker and a nephew Murray Freeman of Blockhouse. She was predeceased by her husband John, infant sister Ruth and her brother William. So sad to hear of your mom’s passing. Our thoughts & prayers are with you. So sorry to hear of your loss…Mrs. Toplis was a very sweet lady, and will be fondly remembered for her caring ways…I had her as a teacher in school and she was an AWESOME teacher…cherrish the memories!!! We remember Irene with great fondness and know that after her long journey can now rest. John you have been a good son. Sorry to hear of your Mom’s passing. Our thoughts and prayers are with you at this difficult time. Sorry to hear of your loss…Our thoughts and prayers as you go through this difficult time. Sorry to here about your moter’s passing. Our prayers & thought are with you. So sorry to hear of your mom’s passing. Our thoughts are with you. Sorry to hear of your Mom’s passing. She is now at peace. Our thoughts and prayers are with you at this sad time. Your mom was a lovely lady and will be missed. God Bless! I am so sorry to hear of your mothers passing. My sincere condolences to you and your family. We are sorry to hear of your mother passing.Our thoghts and prayers are with you at this sad time Keep your happy memories of your mother with you always. We are sorry to hear of your mother passing. Our condolences to the Toplis family. We are sorry to hear of your Mom’s passing.Our condolences to you all at this sad time. We are thinking about you and your family during this difficult time of sorrow. We are so sorry for your loss. Please accept our sincere sympathy. John, Elsa and family: We hope you can relax knowing that your mother is now at peace and resting in God’s arms…keep your good memories close to your heart…take care, and God Bless! Carol and I are saddened by the passing of your mom. No matter how old we get, Buddy, I will always remember the times we spent at your house on Saturdays and your Mom;s french fries. (I remember breaking your arm in the sandbox, too, but you have hopefully forgiven me for that by now). Think of you often. My deepest condolences at your loss. I will remember Mrs Toplis for her kind and gracious manner and her warm smile. She was always so friendly and welcoming in her way and made me feel special whenever I was in her company. She holds a special place in my memories of Milton. We will remember her grace and kindness. She lived a full life and finally is at peace Still difficult for the family but she is now in a better place with no suffering Our thoughts are with you all. So sorry to hear of your Mom’s Passing. Alway’s remember the Happy Times you all had together. Our thought’s and Prayer’s are with you all at this most difficult time. John and Family, So very sorry to hear that your mother has passed.She was a very nice lady. My prayers are with you. Our sincere sympathy to you on the loss of a lovely lady. So sorry to hear of your Mom`s passing. I [Sherri] had her in school and she truly was one of my favorite teachers. A lovely woman. John and family .So sorry to her of your mom;s passing .She was one classy lady . Sorry tro here of your mom’s passing. Had her as a grade 5 teacher and never forgot her. Our condolences to you and your family, God bless! My mother and I were very saddened to hear of Irene’s passing. She will be sadly missed by all who knew her. We hope that you can take some comfort in the knowledge that she is at rest in God’s arms. OUr thoughts and prayers are with you at this sad, difficuolt time. John, sorry to hear of your mom’s passing. John- sorry to hear of your Mom – my dear cousin Irene- passing- my prayers and thoughts are with you at this time. So sorry to hear of your Mom’s passing. She was such a sweet lady. You are in our thoughts and prayers at this sad & difficult time. So sorry to hear of the passing of Mrs Toplis. She was a lovely Lady and a great teacher. She had to leave many great memories. Cheerish them dearly. We were sorry to read in the paper today of your mom’s passing. No doubt a good life well lived. Imagine all the lives she would have touched over the years! Our thoughts are with you and Elsa. So sorry about your mother’s passing. No matter what age, it’s hard to lose them. We are thinking about you at this sad time. Cherish your good memories of her. We just heard of your Mom’s passing. Please accept our sincere condolences. So sorry to hear about your loss. My thoughts are with you. Take comfort in knowing that your mother is now in a beautiful place. So sorry to hear of your mother’s passing. She taught me in grade 5 and was an excellent teacher as well as listener. I still remember her well. Please let us offer our sincere condolences and take this time to remember her and who she was. Our thoughts are with you at this time. Take comfort knowing that Mrs. Toplis lived a wonderful life and is now at peace. We send our sincerest sympathies to you all. The community has lost a wonderful lady!!! John and family, Sorry to hear of your moms’ passing. I know you have alot of great memories to help you through this tough time. Our thoughts and prayers are with you. Dear John and family. Very sorry to hear of your mom’s passing. She was a great lady and school teacher. I know it’s hard, but she is at rest now and you will see her again someday up in Heaven. Sincere condolences in the passing of your Mom. Keep your memories close during this sad time. You are in our thoughts and prayers. Sincere condolences in the passing of your Mom. Keep your memories close to help you through this difficult time. You are in our thoughts. take care. My condolences to Mrs. Toplis’s family. I had her as a school teacher and remember her as a very very nice lady. She is now with the Angels in heaven. John and family. Sorry to hear of your mothers passing. We are happy that you got to spend her 92th birthday with her. I am sure she knew you were all there. Take care and God bless. I feel so sad that the old neighbourhood is missing one of the final members! She was a true lady and I always felt like I was more special for having known and lived near a teacher. I will always remember the last time we spoke and she got to meet my grandson. It just seemed natural for her to meet the next generation. I hope you both will have wonderful memories of her! Take care of yourselves, I am praying for her as she crosses over! Our thoughts are with you, at this sad time. All your family in England send their condolences. We remember Irene with love and admiration, she was a lovely, lovely person, and you have been a good son John. So sorry for your loss. May your many good memories comfort you at this sad time. I first knew Irene when she was my teacher in Liverpool, and later when I, also, became a teacher and a school administrator, I had many occasions to work with her. She was a fantastic influence on many generations of children and her fellow teachers. This will be her enduring legacy. Lorraine and I wish to express our sincere condolences to Irene’s family. So sorry to learn of the loss of your mom. We loved having her at Queens Quilters. Your Mom was such a sweet lady. Whenever she would go by our home she always said it was so great to see cloths hanging on the line. She always said she enjoyed”the children” she taught. Your Mom was Blessed with a loving family and a profession she loved. Fond memories never leave one’s heart. Our deepest sympathy to all of you. Wayneand I were so sorry to hear of your Mother’s passing. She was my grade 5 teacher, she was my favourite teacher. She was a lovely lady who will be missed by everyone who knew her. So very sorry John to hear of your mothers passing, she was always a very nice lady to me growing up in the neighbourhood and later in life when we did work for her, I really enjoyed talking with her, she had time for us all in this busy life. God Bless her. Mrs. Toplis was my Sixth Grade teacher. She was a wonderful teacher and instilled in me a love for learning. I remember the books that she read to us and the lessons that she taught. Truly a wonderful lady and educator. Sometimes we get so caught up with our own problems that we don’t take the time to reach out to others in their time of need. Please forgive me for that. Your Mother always showed an interest in others, and her kindness was always accompanied by an encouraging word. Even with our age difference, I always felt that she was a friend. Maybe it had something to do with her “motherly ways” after I lost my own Mother at age 14.